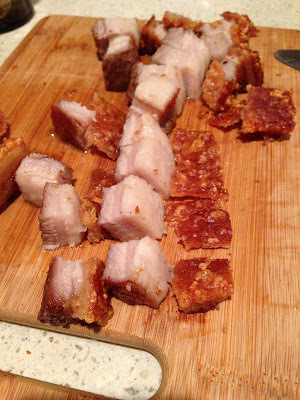 One of my favorite Chinese dishes is Siu Ji Yuk - crispy skin roast pork belly. I remember going with my grandmother to Chinatown and being handed a delicious morsel when we went to the butcher. It made the whole trip worthwhile. When I was home, my sister came home from the market with two small packages of skin-on pork belly. She thought it would be a good idea to make some Siu Ji Yuk at home. I knew my mother had made it at home but I had already moved to Boston and I never got to try her version of it. I don't think the recipe my sister found was the same one my mother used, I'm not sure where she got it from. My sister told me that you're supposed to leave the pork uncovered in the fridge for a couple of days to dry it out. Neither of us was too thrilled with that idea so we skipped that step and just made sure we dried it well with paper towel. 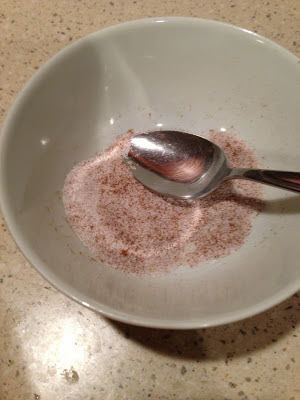 My sister prepared a simple mixture of salt and five spice powder. When I asked about the proportions she told me she just eyeballed it. It's not quite equal parts, a little more salt than five spice powder. 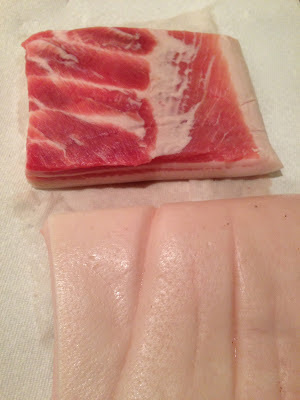 I took the mixture and rubbed it all over the pork belly - both the skin and flesh sides. We put the two pieces of pork belly on a rack over a sheet pan (to catch the drippings). 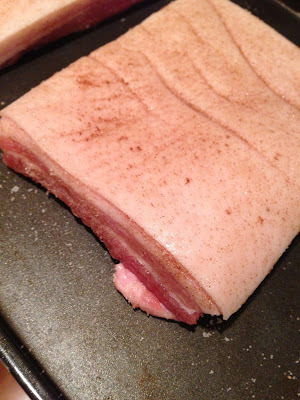 And here's another deviation we made - you should prick the skin at this stage to help drain the fat during cooking. My sister found that it's easier to do this step after the pork has cooked for a bit so we put it into a 450 degree F oven for 30 minutes. (Note: the pieces were small enough that we could do this in the toaster oven.) When we pulled it out the skin was already nicely browned and pleasantly blistered and it was easy to take a skewer and poke holes through the skin to help drain the fat (and there was a lot). You can tell our toaster oven is unevenly heated. We dropped the temperature to 350 degrees F and roasted the pork belly for another 30 minutes, pricking more holes in the skin about 15 minutes into the second roasting. 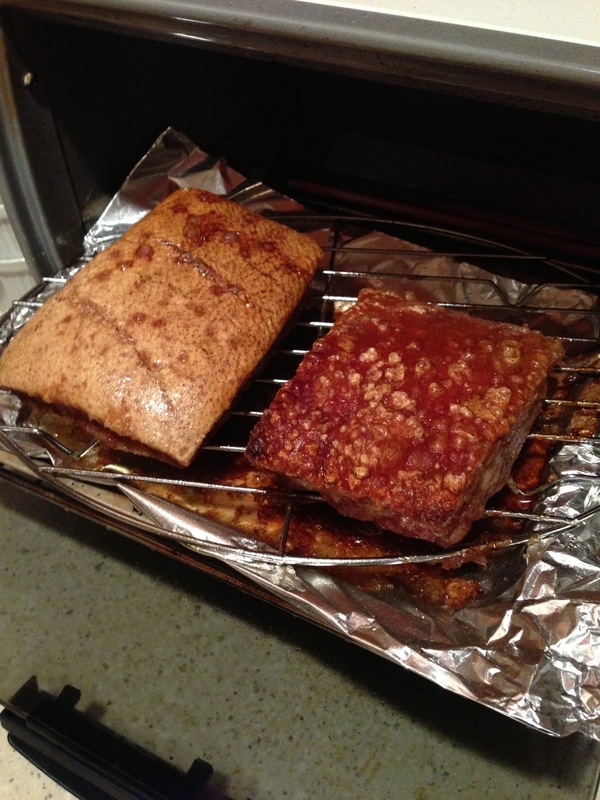 These pieces of pork were on the thinner side so after the second roast, they were ready. We left the lighter piece in a little longer to see if it would darken but the pork belly was cooked through at that point. If they were thicker pieces we would have left them in longer. 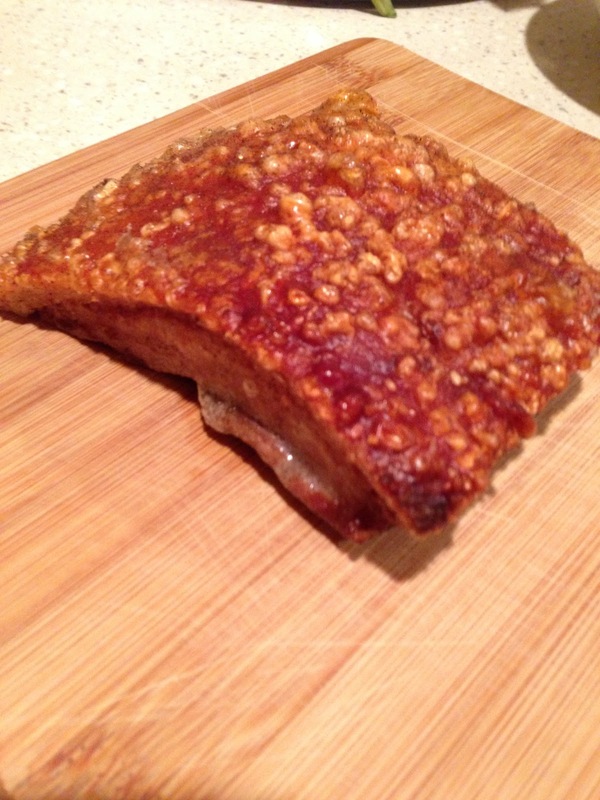 The result was delicious pieces of roasted pork where the skin was incredibly crispy and the pork was flavorful. It's really easy to make and only takes a few ingredients. Usually I like to dip the pork in a little oyster sauce but I these pieces didn't even need it. It was so good! Finished product ready to eat! Thanks to my sister I have another recipe to add to my repertoire. It's delicious, brings back memories, and created new ones. What more could I ask for?